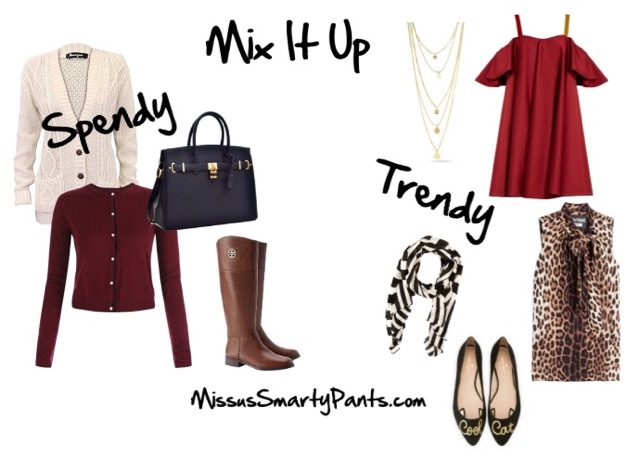 Mix high and mid-priced items with low. Invest in core pieces, then pair them up with mostly inexpensive clothing and accessories. Spend a little each season to update items like trendy tops and necklaces (Use MSP’s Seasonal Previews (every fall & spring season) to will give you the “scoop” on the latest trends!). 1. Add animal print to anything. Animal prints can be used as a neutral. One piece is all it takes to add a little something special to your outfit. 2. Shop your closet first. Chances are there’s already something similar to what you want...hiding right in your very own closet! 3. Invest in pieces that will stand the test of time. Buy a quality handbag that you can carry for at least several seasons, if not for years to come. Purchase top-brand boots and leather walking sandals. I’ve never had a client complain her comfortable shoes (that were expensive) weren’t worth the price she paid. I’ve only heard from ladies that wished their feet didn’t hurt in cheap shoes. Do a cost-per-wear analysis. You will find that more expensive items are often less expensive per wear than a cheaper ones. 4. Go with higher quality denim for a better fit. Many higher end department stores provide free altering. Wash your dark denims (when needed) in cold water and inside out. You’ll have them for YEARS! 5. A good fit can make even a low-priced item look polished and expensive. Don’t be afraid to get items tailored, even if they were cheap. For a few dollars, a tailor can transform the most inexpensive item into a custom fitted piece for you. 6. Every woman should own these essentials in her closet: dark washed jeans, cardigans in 3 different colors, comfortable flats, tees/tanks and lots of scarves and cool jewelry she loves. The combination possibilities are endless and you will always look put together in these. 7. You can look good on ANY budget. Start off spending just $20 a week (or month) to add new items to your wardrobe. You’ll be amazed at what you can find! 8. Bold accessories are an inexpensive way to up the wow factor of any outfit. Pick up statement necklaces, stacked bangles and chandelier earrings at places like Forever 21, Kohl’s and Target.